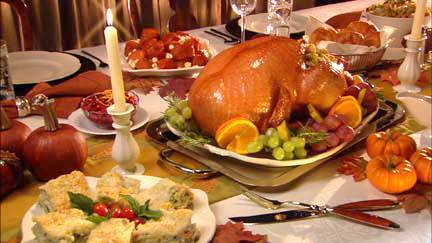 Are you thinking about a tropical Thanksgiving celebration with your family? Maybe a Thanksgiving get away with some friends but still want the traditional holiday meal with all of the fixings? We’re here to help. First… make sure that you’ve got a reservation at one of St. Augustine’s Historic Inns. The inns will all be dressed up in their holiday finery as they get ready for the St. Augustine Bed and Breakfast Holiday Tour on December 12 & 13. This is a very popular time of year in St. Augustine. From the day that the city switches on the Nights of Lights on November 21 all the way through New Years, you’ll want to make sure that you get your reservation in early. Now to find the right place for your holiday meal. If you want traditional or just someplace that’s open, we’ve searched them out. We’ve compiled the most comprehensive list of the restaurants that will be open on Thanksgiving Day. We’ve split them into two groups… those serving a Traditional Thanksgiving Meal with all of the trimmings and those not serving traditional. If they are serving both we put them under Traditional! Please call the individual restaurant for times that Thanksgiving meal is served if not listed. We hope that this helps to make your Thanksgiving day perfect. We’re so glad that you’ll be here visiting. Also, check with your innkeeper for other fun things to do during your stay. Each restaurant that we called said that you want to get your reservations in early as they do fill up. Priority Seating. 3 Entrée Choice menu and fixed price. Rhett’s Piano Bar & Brasserie 66 Hypolita St. 904-825-0502 6 p.m. -2 a.m.
IHOP 2560 State Rd 16 904-829-2215 6 a.m. – 10 p.m.
Sangria’s Wine & Tapas Bar 35 Hypolita St. 904-827-1947 2 p.m. – 11 p.m.
Scarlett O’Hara’s 70 Hypolita St. 904-824-6535 6 p.m. – 12 a.m.